When I was a little girl I remember having the whole turkey, beautiful and golden brown, as the center of the Thanksgiving dinner table. It looked like something you would see in a Norman Rockwell painting. It was the kind of scene that made you feel warm and cozy on the inside. The thing about that beautiful turkey was this…. me and my sister and cousins would fight over the turkey legs. We would play rock, paper, scissors – break the wishbone – draw straws…. you wouldn’t believe the extent we would go to to see which two people got the turkey legs. As an adult my love of the drumstick hasn’t gone away. That’s how this recipe came to be. Thank goodness my family loves the drumstick too. Not only is it super delicious and moist, but it’s inexpensive to buy. So I figured, why fight over the only two that come on the bird, just make all drumsicks.! So that’s exactly what I do. These crock pot cranberry braised turkey drumsticks have just a hint of that beautiful sweet/ tart thing that cranberries have going on without having to slather your turkey in cranberry sauce (which I’m totally not opposed to… I just don’t do it all the time). They also have that earthy sweetness from the garlic and onions. Mmmm Mmmm good! Heat the olive oil in a large pan over medium heat. Brown the turkey drumsticks on all sides. 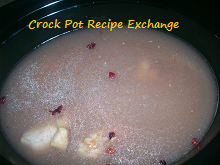 In the meantime, add the cranberry sauce and 4 cups of the chicken stock to a 6 – 7 quart crock pot. Whisk these together until they are completely incorporated. 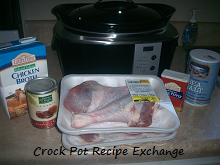 Go ahead and turn the crock pot to low to be heating the liquid up. Add the craisins too. 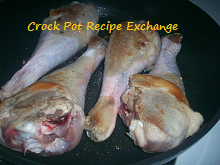 Once the turkey drumsticks are browned, season them well with salt and pepper on all sides. Place them into the crock pot. 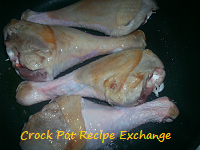 At this point add chicken/ turkey broth if necessary to make sure the drumsticks are completely covered for proper braising. Now you’re going to add the garlic and onions to the same pan you browned the drumsticks in. Cook them until the onions are translucent and soft. Then add to the crock pot. 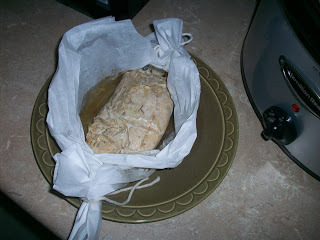 Put the lid on and cook on low for 6 – 8 hours. You want to make sure the turkey is cooked completely. You will see the meat start to pull away from the bone as they are getting completely done. These were SO delicious. 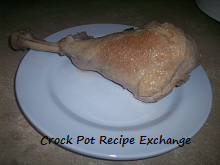 They are the perfect turkey dish to avoid all that “turkey leg fighting” that goes on in our house and a great alternative to a whole bird, especially for a small crowd like mine. 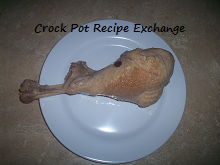 These cranberry braised crock pot turkey drumsticks went perfectly with the other Thanksgiving staples we had too. 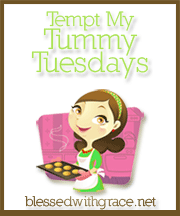 I definitely will be making these again….. and not just for Thanksgiving! 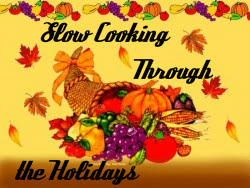 This is part of a “Slow Cooking Through the Holidays” series of crock pot recipes that Hope from A Busy Mom’s Slow Cooking Adventures and I are co-hosting.